Note: Hedging is a financial risk-reduction strategy that market participants can use to lock in future prices. Analysis of hedging can be difficult because not all producers consistently report their hedging activity. In general, producers are not required to report hedge effectiveness in regulated financial statements. 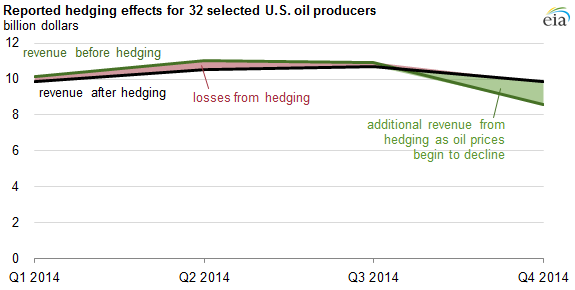 However, 32 U.S. oil producers have consistently reported their hedge results in their financial statements. The portfolio of these producers shows a 22% decline in oil sales revenue, down $2.4 billion from $10.9 billion in third-quarter 2014 to $8.6 billion in fourth-quarter 2014. But because of $1.3 billion from hedging activities, the combined sales and hedge revenue in fourth-quarter 2014 had a milder decrease of $1.1 billion.